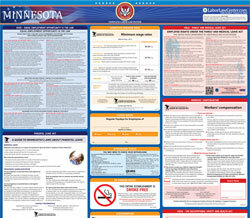 The Mandatory State Labor Law Poster Pack is a general labor law poster poster by the Minnesota Department Of Labor & Industry. This is a mandatory posting for all employers in Minnesota, and businesses who fail to comply may be subject to fines or sanctions. It appears you don't have a PDF plugin for this browser. Please see the link below to download minnesota-mn-poster-pack.pdf. ■mandate retirement age if the employer has more than 20 employees. job requirements must give 30 days notice of intention to terminate. (651) 284-5070 • 1-800-342-5354 • [email protected] • www.dli.mn.gov Posting required by law in a location where employees can easily see this notice. and your employer’s safety rules. agents you are exposed to at work. health concerns with your employer or with MNOSHA. abatement dates issued to your employer by MNOSHA. days to file a complaint with MNOSHA. medical records it has about you upon request. documents  where  other  notices  to  employees  are  posted. resulting in the death of an employee. inspections, interview employees and review records. equipment and training at your expense. Contact MNOSHA for a copy of the Act, for specific safety and health standards or to file a complaint about workplace hazards. U.S. Department of Labor, Occupational Safety and Health Administration, Chicago Regional Office, 230 S. Dearborn Street, Room 3244, Chicago, IL  60604. Have you lost your job or had your work hours reduced? This information is available in an alternative format by calling 651-259-7223. DEED is an Equal Opportunity Employer/Provider. ■Get any necessary medical treatment as soon as possible. ■Wage-loss benefits for part of your lost income. Posting required by law in a location where employees can easily see this notice.